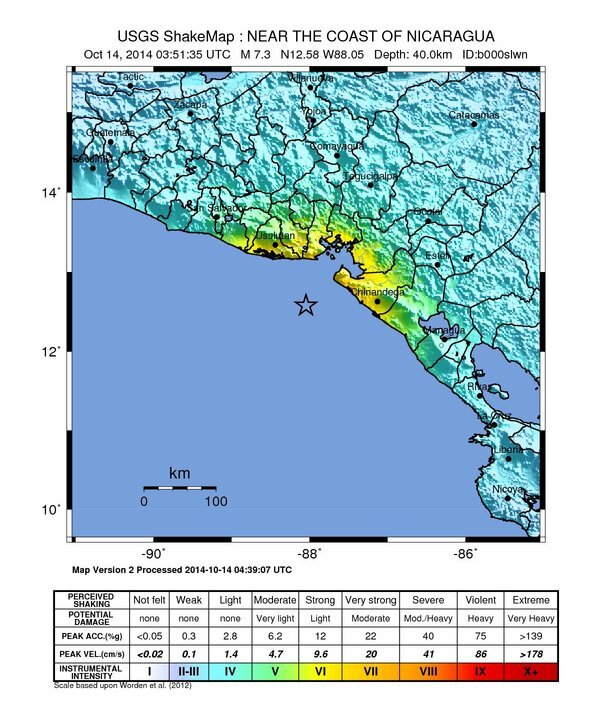 The October 14, 2014 M 7.3 earthquake off the coast of El Salvador occurred as the result of normal faulting in the Central America subduction zone. The location and depth of the earthquake are consistent with its occurrence either within the subducting oceanic Cocos plate, or in the accretionary wedge of the overriding Caribbean plate, rather than on the main subduction zone thrust. At the latitude of this event, the Cocos plate is converging with the Caribbean plate at a rate of roughly 73 mm/yr in an east-northeast direction. 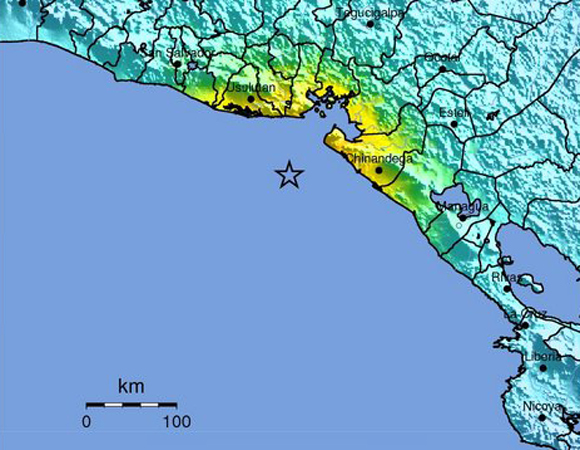 The approximate depth of the subducted Cocos plate at the location of the earthquake is 50 km. 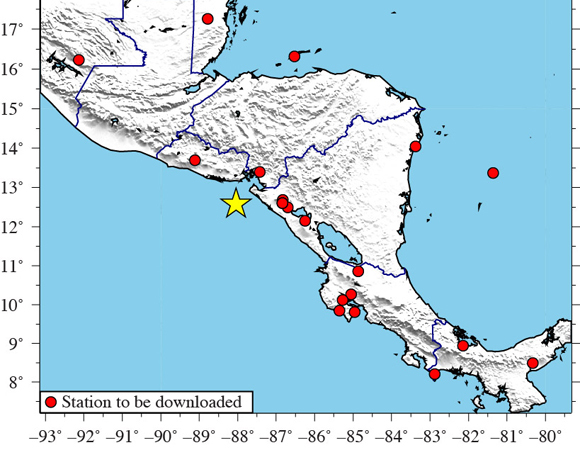 In response to the Mw 7.3 earthquake 67km WSW of Jiquilillo, Nicaragua on October 14, 2014, UNAVCO is downloading high-rate GPS data from a total of 25 stations within 1,000 km of the epicenter (Figure 2). 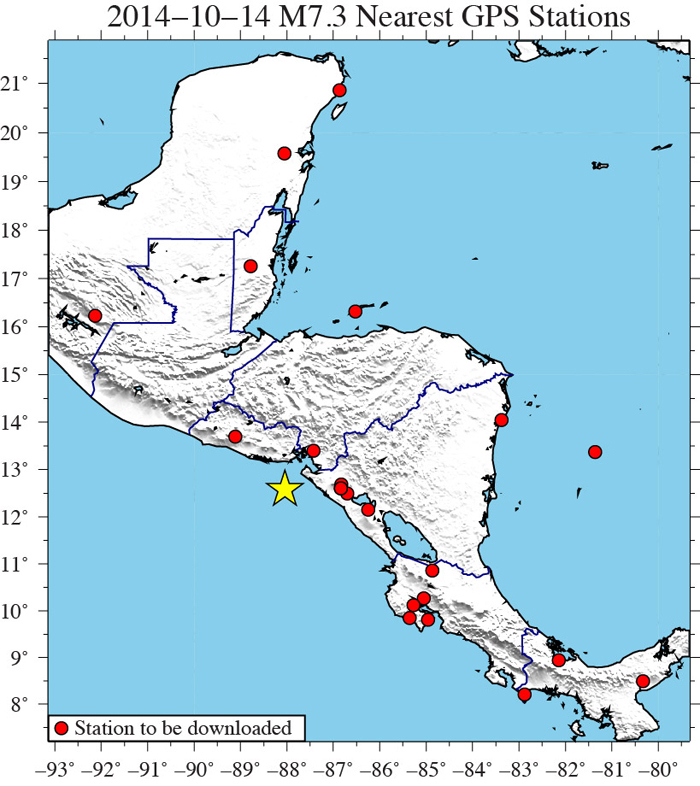 One-sample-per-second (1-sps) GPS data were collected for a five-day period around the event (day of event plus two days before and after). Five-sample-per-second (5-sps) GPS data, where available, will also be collected for a 12-hour period (± 6 hours) around the event. These data are available from ftp://data-out.unavco.org/pub/highrate/.